When see the veiled bride walking down the aisles, we rarely stop to think about the headgear she wears. Veils are classified into different categories based on their length. We have discussed the 8 types of wedding veils below. Birdcage: The birdcage design was very popular in the 1920s. Today, it has become a favorite at red carpet events. 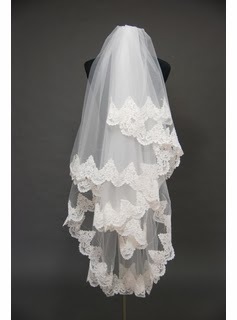 As known as the Russian veil, it is a short style made of lace or net that bears an uncanny resemblance to fishnet material. It falls to chin and covers the face of the bride. It is typically attached to a headband with a headpiece - a flower or elaborate bow -pinned to one side. Blusher: A blusher veil can be called a variant of the birdcage style. It is the same length as a birdcage, but long enough to be flipped behind when it is time to kiss the bride. Unlike the birdcage style, it is made of transparent material. 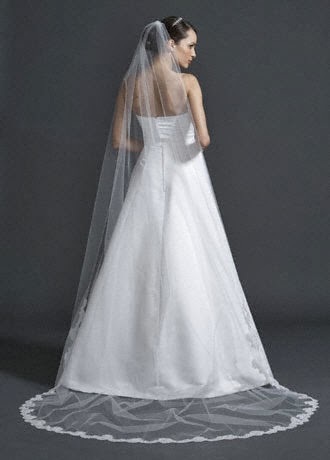 Shoulder-Length: Longer than a birdcage, a shoulder-length veil hits at the shoulders. It complements almost every wedding dress pattern. However, it highlights the collarbone and hence it the best match for a strapless gown. Elbow-length: The elbow-length veil is all-time favorite of traditional and modern brides for its free flowing look and manageability. It is the length of your elbow. It looks best on wedding gowns with a full skirt and without a train. This style is an ideal option for a day time event. Flaunt an elbow-length veil with a half-updo hairstyle. 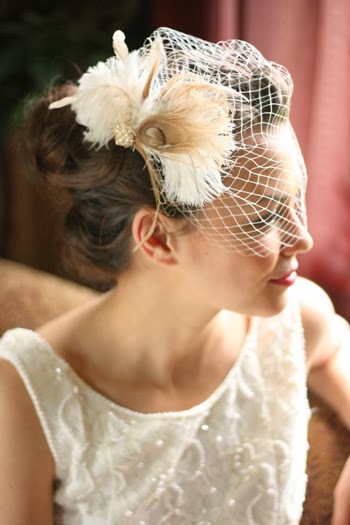 Flyway: Many modern brides prefer to go without a bridal veil, but don one only to adhere to tradition. If you are one of them, the flyaway veil is meant for you. It falls to the shoulders and is layered. A few designs are wide and voluminous. Its layered structure catches the wind and hence the name "flyaway". It is a great option for a young and cute bride as it reflects a carefree nature. It is more informal in its appeal. Fingertip-length: This one is neither too long nor too short. It is as long as the fingertips. They flatter all face shapes and body types. It is stylish, simple and elegant. One can add layers and ruffles to tone down its formal look. Avoid wearing a fingertip-length veil with knee and ankle-length wedding gowns. 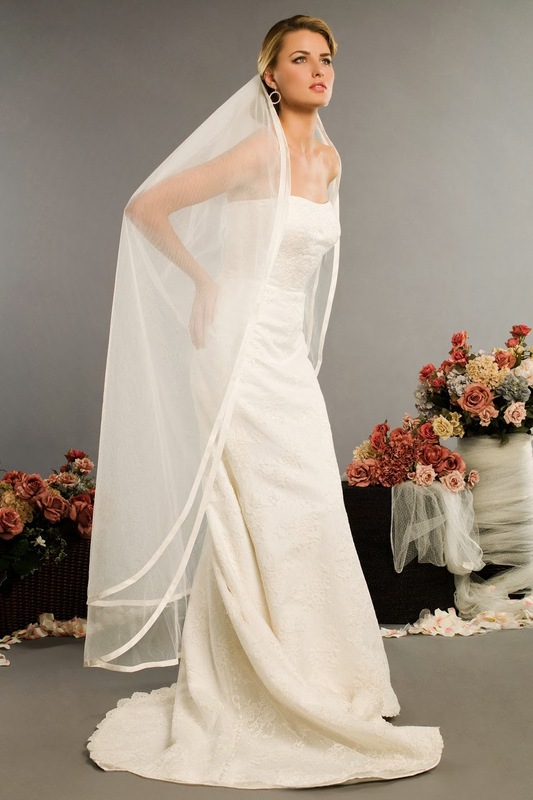 Waltz: This veil flows down from the headpiece to the ankles. This is a good option for a dress that does not have a train. It is single layered. It looks good with chic short wedding dresses. Cathedral: This is the longest veil in the list. They are worn at strictly formal weddings especially by royal brides. This style looks good when paired with wedding dresses designed with a long train. It is floor length and exceeds the length of the dress train by minimum 6 inches. It is difficult to manage, but is worth the trouble for its regal and stunning look. Cathedral veils are embellished with beadwork, motifs and embroidery.